Any vinopanion of mine can tell you that I love wines made from mountain fruit. Give me those highly structured, dark and angry-fruited wines any day of the week! They also might be able to tell you that I grew up in Napa Valley and so I have tasted quite a few wines from its many appellations. What they may not be able to tell you is that I grew up at the base of one of my top two favorite wine regions of the world…Mount Veeder. One morning in late August, I had the lucky opportunity to take part in an intimate escape to one of the few Mt. Veeder wineries that I had yet to visit, the craftsman Estate of Rubissow Wines (Facebook). Our blogger takeover of Rubissow’s peak of Mount Veeder came courtesy of Leslie Bramwell-Smith and the inimitable Thea Dwelle (Twitter). I trekked up there with Liza (Twitter) and Xandria (Twitter) from the Brix Chicks and we arrived just on time, after passing the blue trashcans and making a left at the stars, etc…hey, it’s the backroads of Napa, ok?! We started off with a very warm introduction to 2nd generation vintner Peter Rubissow and Autumn Berry, Estate everyperson who lives on the mountain and is also a very accomplished chef, which was happily proven later in the day! After the arrival of everyone else and the beginnings of a huge heat spike (it topped 104 on the mountain that day), we grabbed a very nomnom taste of the first wine of the day, the Rubissow Mount Veeder Estate Trompettes 2005. This is a blended wine, made in the style of St. Emilion in Bordeaux, following their lead of a Cab Franc-based blend. This has always been a favorite wine of their father, Co-Founder George Rubissow, as well as a recommendation by their friend and consultant early on, the famed winemaker André Tchelistcheff. 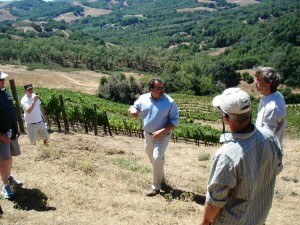 Following that, we headed off up the mountain for a vineyard hike to the top, just as their calmly energetic winemaker Timothy Milos (WineLog) zoomed up, in his A3. Once at the top, we were treated to quite a view. Rubissow’s portion of Mt. 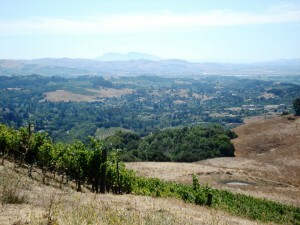 V is actually more similar in soil and climate to the south-bordering Carneros appellation. The soils are more of an ancient marine sediment origin and the climate is also a bit cooler (usually, heh) in the afternoons than much of the rest of Mt. V. As we looked out over much of the Bay Area, you could see my home neighborhood in Browns Valley and Mt. Diablo off in the in the distance, below which I now live with the Lady. Further west, you can just see a hint of SF and more prominently, Mt. Tam…amazing! The group split off on the way down the mountain, and some of us opted to take the road less vinted, with a trek through the ancient redwoods, filled with California Bay Leaf. Dodging angry rare woodpeckers, we did make it down safely, in time to dig into the wonderful meal prepared for us by Autumn. We also now had the opporunity to try the rest of the current wine offerings from Rubissow. 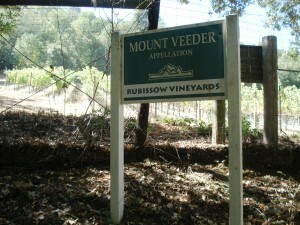 I went into the Rubissow Mount Veeder Estate Merlot 2005 first, after tasting the ’09 offerings in the vineyards on the way back. It was a tremendous effort by Tim, possibly one of the best Merlots I’ve ever tasted. Deep black fruit in the nose was complemented by bay leaf, dust , rosemary and just a welcome hint of oak. 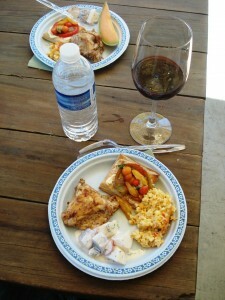 The palate was very balanced and food-centric, elements I came to associate with all Rubissow wines that day. It was a true accomplishment of winegrowing and winemaking, and proof that a sense of place can be found in domestic wines. We continued to taste through the rest of the Rubissow offerings and chatting about wine with Peter and Tim leading the discussion. A light breeze had picked up by then and was blessed by all in attendance. All of the wines showed well, including two unreleased and still slumbering wines that we had the chance to try towards the end of our stay: an everyday red wine blend and an Estate Syrah, that was very exciting with good black pepper, meatiness and a hoppy, floral finish. The wine’s bouquet was completely unruffled by the stolen sips wine by the estate dogs, even! 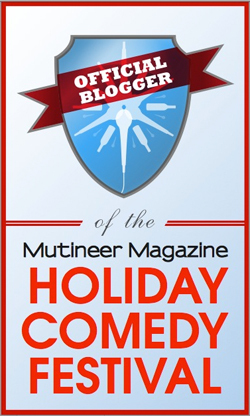 One last task remained before we headed down the mountain…a blogger/vintner showdown in the basement! 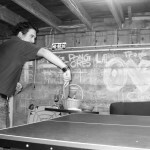 Mano y mano, we battled again and again, but the seasoned veteran vintner was triumphant and I was beaten 22-20 in a rousing game of ping-pong, replete with cheering Brix Chicks. 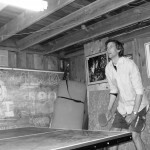 We had a phenomenal time that day and a very big thanks goes out to Leslie, Thea, Peter, Tim and Autumn! Please peruse my reviews below of all of the terroir-driven wines that we tasted from Rubissow that day. If you would like to list them in your own WineLog, they have all been tagged with “Rubissow2009Blogger“. All of my photos from that day can be found on my Flickr. Enjoy! Would love to go on a trip to wine factories. Hello Paul! My wife Beth and I were actually up there this Saturday, too! We must have seen each other. I was in the Ireland sweater. Very good times and I enjoyed a decanted ’05 Trompettes last night at dinner with the Lady! 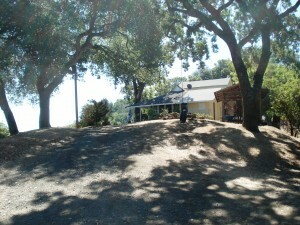 I was just up there on Saturday, with my wife, harvesting 2009 Merlot! The 2005 Trompettes is AWESOME! 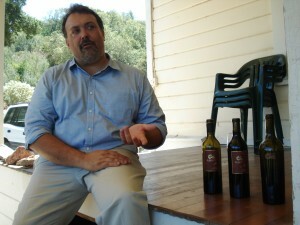 We also got to preview the 2007 Trompettes, which will be great by the time it is released! Oh! How I love wines!